How do you say you’re against everything—or even just most—of what Donald Trump stands for, and not get sucked into a constant nyah-nyah race to the bottom of just being anti-Trump? People across politics have been trying to figure that out, looking for how to resist a president chipping away at America’s core without having their words reduced to a zinger tweet or monster truck rally headline. This is an issue for the Democrats gearing up to run for president who insist that their campaigns can’t just be about Trump, and for the few Republican critics left in Washington who want to have a debate outside of a Twitter feed. But no one’s grappling with it quite like Barack Obama. Obama wants to talk about what wasn’t political or personal before Trump made everything political and personal, but every time he does, it feeds into their dynamic—in part because Trump and his supporters and the media want the mud fight, and in part because his exasperation keeps making him slip in jokes at his successor’s expense. He wanted to be mostly done with politics, but he decided Trump gave him no choice but to step back in through the fall. Now that Obama is done with his midterm campaigning that was all about opposing Trump, he wants to be seen as standing up for civility and facts and an international order. It’s only because those things stand in such contrast to Trump that they become an attack on Trump. Months ago, Obama’s aides pointedly scheduled this event on Tuesday night at Rice University in Houston as part of a long-term plan to try returning him to statesman mode after his two-month burst of rip-roaring campaigning against Trump. The atmosphere seemed right: the 25th anniversary gala for the Baker Institute, with Obama and former Secretary of State James Baker in black tie, in a conversation moderated by Jon Meacham, George H.W. Bush’s biographer. And while he tries his level best to avoid talking about Trump, Obama did make it clear Tuesday that he doesn’t think Trump deserves to be in the Oval Office, based on his behavior, and that Trump’s politics is rooted in a perverse “hatred” that he can’t abide. Before election night two years ago, Obama never thought about Trump much. When he did, it was as the birther carnival barker who seemed like the embodiment of his caricature of Republicans. It was all sort of captured in that night in 2011, when Obama united the Washington Hilton ballroom in laughing at Trump at the White House Correspondents Dinner, then headed back to the Situation Room to watch the end of the bin Laden raid he’d ordered before putting on his tux. He publicly laughed off Trump’s chances throughout the 2016 campaign, and they’d never spoken before he called Trump a little after midnight on election night to congratulate him on winning the presidency. 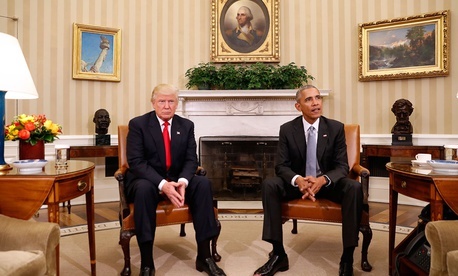 They’d never met before Obama welcomed him into the Oval Office two days later, and then planted himself with his legs spread out, body language showing he felt like he was welcoming the president-elect to his house. Tuesday night in Houston, Obama told a story that he said will appear in the memoir he’s been working on, likely out next year, of his own first time in the Oval Office, there as president-elect himself to meet with George W. Bush. It was impossible to miss who was missing from that list. “This is important, and there’s a civic religion and a set of ideals and a set of principles that we won’t get perfect, but we should strive to perfect,” Obama said. Piping up next to him: Jim Baker, the former chief of staff to both Ronald Reagan and George H.W. Bush, who in between cycled through as Treasury secretary and secretary of state, the most eminence and most grise the GOP has. “These institutions make America stronger, and we shouldn’t be attacking them,” Baker said. Meacham, guiding the conversation, referred to Trump at one point as Voldemort, saying, “I’m not going to say his name.” (Baker didn’t get the reference, and Obama had to explain it to him.) His appearance with Baker even gave Obama a reason to stop by the home of George H.W. Bush and bring him a pair of socks, which the older former president is famous for loving. Obama and Baker couldn’t have more different experiences over the past 30-odd years: while Obama was writing poetry to his college girlfriend at Columbia, Baker was negotiating Reagan’s tax cuts; as Obama was coming off his losing 2000 primary run against Representative Bobby Rush back home in Chicago, Baker was off to Florida to manage the recount battle that put George W. Bush in the White House. Though Obama praised George H.W. Bush’s foreign policy, which Baker managed, “as important and as deft and as effective a set of foreign policy initiatives as we saw in recent years,” he and Baker don’t fully agree on many areas of foreign policy. They’ve never endorsed the same candidate for anything. Tuesday night, they agreed on almost everything: the never-ending news cycle is awful, any sense of the center or rational debate has disappeared from Washington, facts have been turned into a maw of partisan point-scoring, Congress is stuck in permanent campaign mode, the internet has made human interaction worse. Obama even got Baker to eventually agree on the need for independent redistricting reform. Mostly they kept agreeing that America shouldn’t stand for what Trump is doing. And they agreed that no one in power in either party had recognized or adapted quickly enough to how much frustration there was out in the country about how rapidly the world has changed. Obama built out the argument. “I think it’s important to remember that identity politics doesn’t just apply when it’s black people or gay people or women,” he said. “That came back to bite us,” Obama said. They agreed on how the media has been politicized, and how dangerous that is. “You tune into Fox News, you’d think you were listening to the house organ of the Republican Party. You tune into MSNBC, you’d know you were listening to the house organ of the Democratic Party,” Baker said, though Obama immediately pointed out the notable wording change between the two sentences—between think and know. Baker marveled at the current state of the Republican Party almost as much as Obama did. The Reagan administration couldn’t have been more conservative, he said, and still, there was legislation passed, and human relationships that helped get those deals done. Trump, meanwhile, tends to reference history with lines about Abraham Lincoln, “most people don’t even know he was a Republican,” or about the Civil War, “Why could that one not have been worked out?” But mostly he talks about history only as a point of comparison for his own exploits—he’s accomplished more than any other president, he likes to say, in reference to whatever he’s speaking about at that moment. “American leadership in the world is absolutely imperative, no other country can do it,” Baker said.